On Monday, July 1, 2013 members of the Penokee Hills Education Project and their supporters held a press conference in downtown Hurley, Wisconsin. 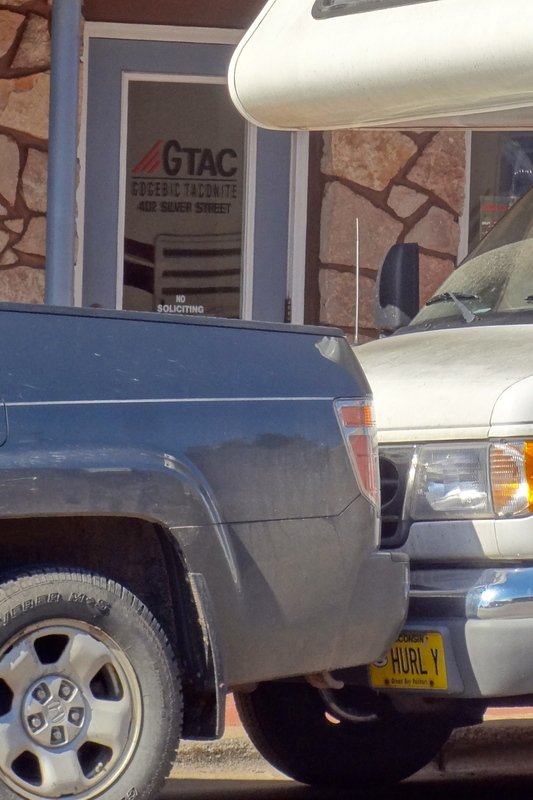 Vehicles blocking the sidewalk in front of GTac offices in downtown Hurley. The event was scheduled an hour and a half before the Iron County Zoning Committee’s public hearing on a proposed mining ordinance. It was slated to take place on the sidewalk in front of the offices of Gogebic Taconite, a company with plans to obliterate the Penokee Hills and extract low-grade iron ore. When organizers arrived, they found that the sidewalk had been blocked by a large pick up truck and an RV. The crowd of fifty people moved across the street to a vacant lot between two local bars. Several locals attempted to disrupt the news event by standing outside the Krash Inn and shouting disparaging comments, but they were largely ignored. Hurley police officers patrolled the area in squad cars and on foot. Chief Daniel Erspamer was on hand to advise people not to block traffic or the sidewalks. Although the press release announcing the news conference was distributed widely across the state, only two other members of the press were in attendance: Paul Schmidt of Wisconsin Eye, and Cortney Ofstad of the Ironwood Daily Globe. Click here to see the video of Bad River elder Joe Rose’s speech. 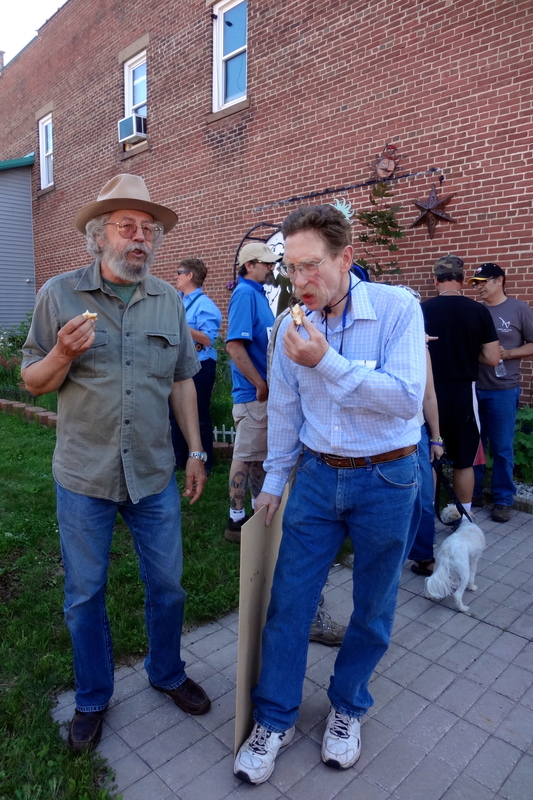 Richard Ketring and Jeff Silbert share a piece of fresh fry bread. After the press event was over, a large bowl of fry bread freshly prepared at the Lac Courte Oreilles Harvest and Education Camp in the Penokee Hills was served to the audience and passers-by. The Harvest and Education camp is located at the end of Moore Park Road off of Highway 77 in the town of Upson. It lies near the banks of the Tyler Forks river and in the foothills of the Penokees and was established this past spring as a base camp for people wishing to learn more about the flora and fauna of the region, as well as traditional Ojibwe healing and creative arts and foraging techniques. For more information on how to support the struggle to protect the Penokee Hills contact the Penokee Hills Education Project.